Beach For Dogs provides dog owners with an elevated and personal level of professionalism, care, and service in the dog care industry by developing meaningful relationships with our clients, employing passionate and experienced professionals, and meeting our clients’ needs with flexibility and understanding. Our locations are managed with a smart casual style. They are between 2,000 - 4,000 square feet. and are decorated with a vibrant and sophisticated beach theme. We currently have three locations in Illinois, all of which are cash flow positive. Our customers are successful, busy professionals that demand personal attention and knowledge of their pets. To fit pet care into their busy lives, they require a company they can trust to handle all their dog's issues including monthly grooming, pick up and drop off, dog boarding, daycare, and veterinary care. Beach for Dogs offers our clients unparalleled customer attention, knowledgeable and experienced staff, and full-service pet care at a single location. We maintain constant interaction with our clients, including social media interaction, pick up and drop off services at their homes, and cameras in our facilities for owners to view their pets. As a result of this passion for our customers, they pay above market prices for our services and the time saving convenience Beach For Dogs provides. We are seeking $75,000 in the form of convertible debt investments to finance additional locations. Each location will then be sold as a frachise with a projected ROI of 10% upon each sale. 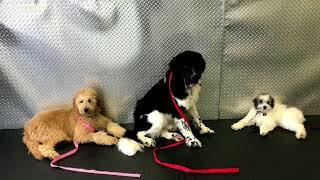 All dog services from daycare, training, food, supplies, and veterinary services. We seek to provide our customers an elevated and personal level of professionalism, transparency, care, and service in the animal care industry through a meaningful relationship with owners, experienced professionals, and flexibility for our customers’ busy lives. That is the environment we set out to create at Beach For Dogs. We want your dog to have a tail-wagging good time whenever they visit. Whether it is for daycare, grooming or training, it is our goal that your dog is treated like one of the family, which they are. How does that translate to our training? Beach is actually an acronym which stands for Behavioral, Educational And Coaching Health for dogs. As an owner we know you want your dogs to behave well, so we’ll teach them how, coach you on how to keep your dog well behaved, and you’ll have a healthy life with your pup. When your dogs visit Beach For Dogs, they become one of our family members. Surf’s up – come on in! Steve is the founder of the Beach for Dogs family and focuses on growing the business and franchise sales. Steve has prior experiance in banking and scaling a business. Steve’s high energy results orientated management style is contagious. Steve empowers all his managers to achieve there goals personally and financially while simultaneously working in there life’s passion. Steve is Tony Robins and Cesar Milan, and everyday, everyone loves to go to work. Zach is an energetic young man, who joined the business to spread his love for dogs. His dad, Steve, and Zach built this company together and continue to grow it every day. Craig Kurek is an experienced business man, dog handler, and passionate family man. As a manager at BEACH for Dogs his goals include excellent customer service, outstanding instruction to create happier and healthier dogs, and happier owners. In addition to his primary job functions, Craig spends his time as a certified animal therapist, working at hospitals and with his own dogs to provide therapy visits to patients. Craig continually works to build on his previous experience as a military working dog handler by striving to grow his knowledge in all things canine. Tina is an experienced manager within the financial, sales, and pet industries. She began her career in 2000 as a Teleservice Production Coordinator at Reed Business Lists, and held coordination positions until 2014 when she transitioned into a Supervisor role at PetSmart in Aurora, Illinois. She currently serves as a District Manager at Beach For Dogs and is in the process of purchasing the Naperville, IL Beach For Dogs location. Rich White is a former "Big-4" Audit Supervisor, Fortune 500 International Controller, and CFO. Rich has experience as a Corporate Controller and has owned a small accounting and tax practice that provided outsourced CFO services to small and medium sized companies. His specialties include Offers in Compromise with the IRS and consulting. Rich is a graduate of Roosevelt University where he studied accounting and finance. Michael Liss is a franchise, business, and real estate attorney practicing in the Chicago area. A member of the State of Illinois Attorney General’s Franchise Advisory Board, Michael’s specialities include franchising, M&A, shopping center leases, and entrepreneurship. Previously, Michael served as General Counsel at The Hair Performers, a hair salon franchise, and earned his J.D. from the Loyola University Chicago School of Law. Mark Siebert is an experienced president, consultant, CEO, and board member of iFranchise, a franchise development and consulting providing services to start- up and established franchisors and companies exploring franchise opportunities. Mark’s specialities include assisting franchisors, research, financial analysis, and business planning. Mark is a graduate of both the University of Illinois at Urbana-Champaign and Northern Illinois University where he received degrees in political science, journalism, and an MBA in marketing. Matthew Jonas is the president and co-founder of TopFire Media, an award-winning, public relations, and digital media agency in the franchise industry. As an entrepreneur and marketer, Matthew has 20 years of experience in digital media. Matthew is a popular keynote speaker, and regularly contributes to Forbes. Matthew attended Harper College, majoring in business. is an experienced attorney and has been practicing for over 25 years at Kelly & Karras, Ltd. Bill resides in Oak Brook, Illinois.